Welcome to our new interview series where we get to introduce you to the Trigger Points contributors. Our first interview is with Nikki Patrick, author of Taking Back What is Mine. The most surprising thing for me has been how much having children of my own has helped to heal old wounds from my childhood. Giving my children the things all children should have and watching them grow into secure and independent little beings has been so empowering to me, and allowed me to really come to terms with all that I didn’t have. My proudest parenting moment came several weeks ago in the grocery store parking lot. The sun was shining, the air was warm, and we were having one of those days where you just really feel like you are doing a great job at this parenting thing. My daughter looked up at me and without missing a step said, “I love you mommy, you are my best friend.” I felt such pride and joy. Pride that I am raising such a healthy happy kiddo and joy that I even have the ability to do so. No, I had no difficulty participating. I have found that being open and honest about my experiences has been very healing and helpful on my journey. I pull strength from other survivors who reach out to me and tell me they’ve been there; they can relate. I believe it has changed me in that it renewed my desire to connect with and be a resource for other parent survivors. Parenting as a survivor of childhood sexual abuse is such a unique experience. This project has affirmed that there is a huge community of us. We can be such a great source of support and help. My children have taught me what love really looks like. There are no expectations, no conditions. There is forgiveness. There is security. Each day they teach me to love, to feel joy in every moment, and what childhood should and can look like. I enjoy spending time with my husband, watching mindless t.v. shows, and occasionally going for a run. 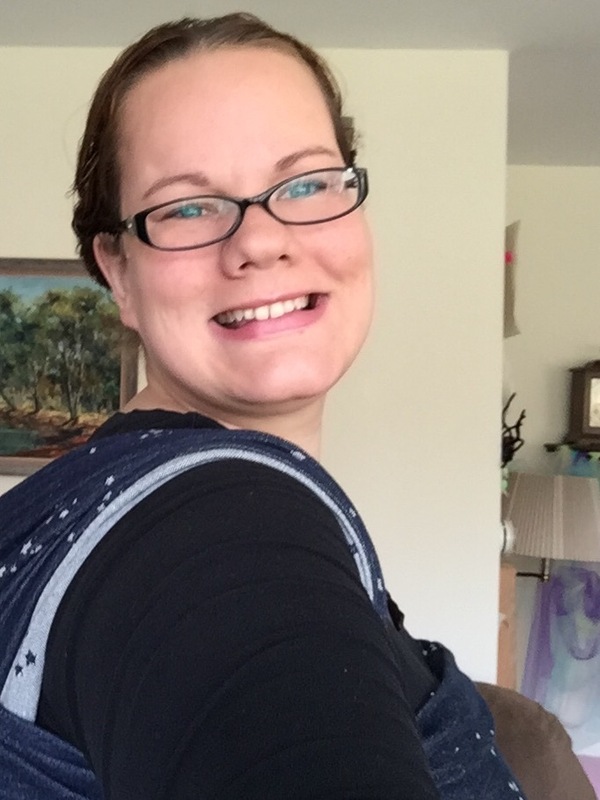 I am also a volunteer Babywearing educator and enjoy helping other caregivers bond with their babies. When I found out I was pregnant with my daughter, breastfeeding her was the furthest thing from my realm of possibility. I couldn’t imagine nourishing my child from my breasts, which I considered dirty because that is what I had been taught. Also, the idea of someone having on demand access to this private part of my body sent me back to being 8 years old and not able to say no. The idea horrified me and I decided that formula was the way for me. Nikki is a 31 year old living in the suburbs of Chicago. She is married to her amazing husband, Josh, and they have 2 beautiful children, Grace (2.5) and Brendan (9 months). She is a stay at home mom with dreams of becoming a motivational speaker. The first 18 years of her life were littered with abuse, abandonment, neglect, and pain. She has used her experiences to create the life she always dreamed she would have and write her new story from here on out. Nikki, it’s such a joy to get to know you a little better! Your essay in the book is really powerful and I know it would’ve been helpful for me to read when I was facing breastfeeding.